Here are the Top 10 ebooks downloaded from the Free Library's OverDrive Digital Library in December 2015 to close out last year. More than 85,000 ebooks were checked out and downloaded for the month! New entries to this month's Top 10 include the latest installments in long-running series from Lee Child and Janet Evanovich respectively, featuring their characters Jack Reacher and Stephanie Plum. Downloads for Andy Weir's outer space survival adventure The Martian are still holding steady since the popular movie adaptation starring Matt Damon. 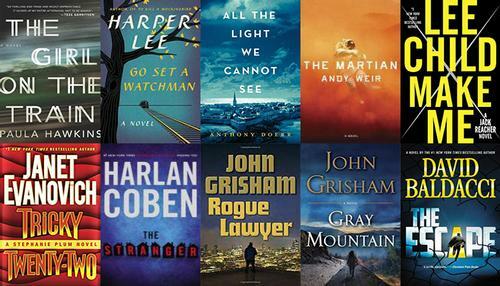 Mystery and Suspense Thriller genre titles filled out the rest of this month's most downloaded titles from authors as Gillian Flynn, Harlan Coben, David Baldacci, and two novels from John Grisham..
Bounty hunter Stephanie Plum is back in her 22nd mystery, involving a fratenity, goofy pranks, a big man on campus nicknamed Gobbles, and a murder. There's also the requisite love triangle, this time between Trenton cop Joe Morelli and security expert Ranger. Can Plum solve the case and get the guy? If it's a John Grisham novel, you can expect a suspenseful legal drama to unfold between the pages. Gray Mountain does just that and ties in nicely to current global warming and environmental issues with it's Big Coal and fracking backdrop. After she is downsized from a a huge Wall Street law firm, Samantha Kofer moves from NYC to a sleepy little burg in Virginia to work at a legal aid clinic. Her new job takes Samantha into a dangerous world of big business corruption, as she fights to give a voice to and legally protect the residents of her new home. U.S. Army special agent John Puller is back for his 3rd and most dangerous mission yet in David Baldacci's The Escape. A prisoner has escaped one of the most secure military prisons in the world and Puller is called in to track the fugitive—his own brother. Once on the case, questions quickly arise about the validity of his brother's conviction. But if his brother is innocent, who framed him and why? Pick up this pulse-pounding, action-adventure tale and find out!